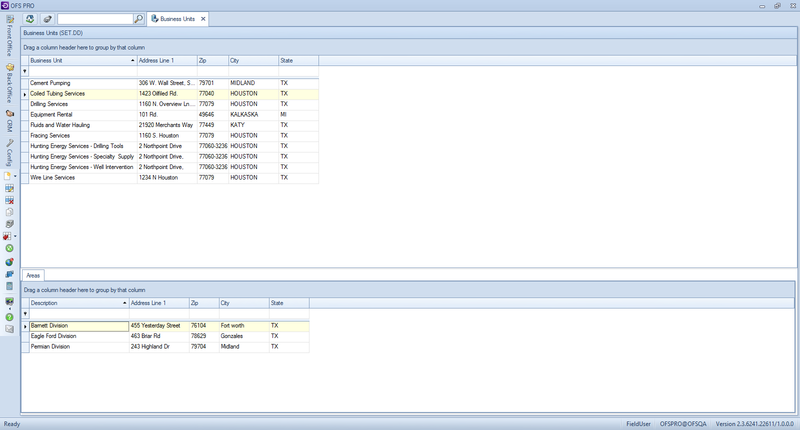 Open the “New Business Unit” window by pressing Ctrl+N or right-clicking in the grid and selecting New from the menu. All yellow fields in the window are required information, while white fields are optional. Enter the business unit’s name, logo image and address. Checking “Allow Work Orders Across Month-End” will enable you to extend Work Orders created for this business unit across multiple months. The other tabs allow users to fill additional information that will appear on the signature pages in the Mobile Work Order Interface. Click OK to close the window and save the new Business Unit. Locate the existing business unit in the business unit grid. Navigate to the “Areas” tab below the main grid. Right-click in the grid and select New from the menu. Enter the area’s name (description), address and its accounting code (optional).